Never miss a recipe! Subscribe for free! At home we like rice a lot, and as lately we eat it almost every 3 days, sometimes we need to do R+D to get out from the routine and surprise palate with new contrasts. This is one of those “exotic” ways to prepare rice that I have tried today -taking advance that it is bank holidays- for the first time, and for sure it will not be the last one. 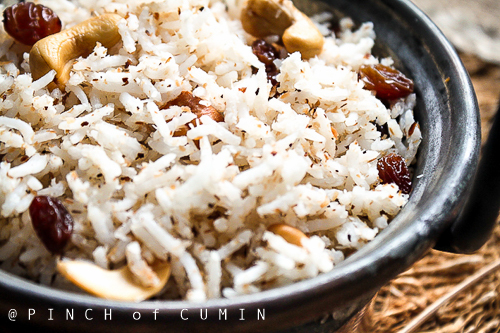 The recipe I have used as a basis is Indian rice with coconut, but as I cannot keep still and follow a recipe from the very beginning to its end, I have tuned it my way, by simplifying it. Heat water with a pinch of salt until it boils. When it is boiling, add raisins so that they hydrate and take it out from heat. 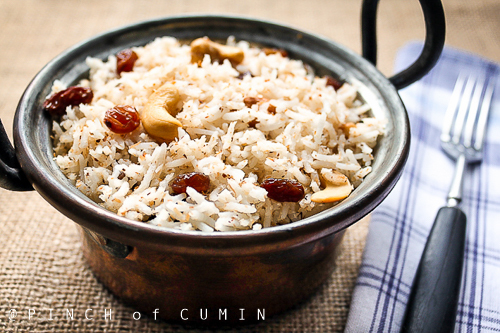 Boil basmati rice the same way you do it normally (in my case, with rice cooker). Heat oil in a skillet or in a wok and when it is hot, add coconut and stir it frequently until brown (nice aroma in your kitchen). When it is brown, add raisins and after it, rice. Finally, add cashew nuts and mix accordingly. It is great either if it is cool, as a summer salad, or if it is warm (this last time I have just eaten it warm). 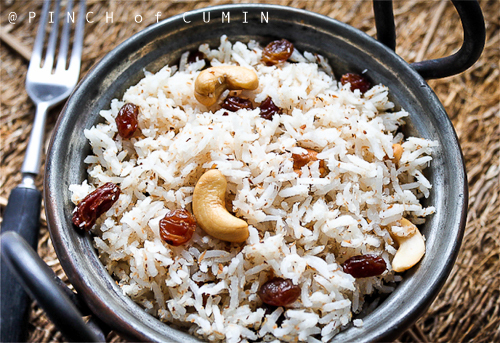 3 Comments to "Basmati rice with coconut and cashews"
Que rico y nutritivo, me guardo la receta, seguro que mañana la pruebo.